There’s plenty for children to do whilst enjoying a visit to Totties – and that means you can enjoy your visit too! Our pets aren’t your usual cats and dogs; instead we’ve got lambs and sheep. 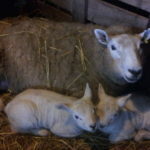 We’re adding to our flock all the time and during Easter each year lambing is usually in full swing. You never know… you could be the first to meet our newest arrival. We’ve also got a range of garden games, including a giant connect four, dominoes and building blocks for the little ones. Make a bird feeder – when the temperature drops food for birds & other wildlife becomes scares. Help our wildlife out by creating a feeding station. Remember to include all types of seeds, nuts & fat snacks to make sure a wide range of birds & animals get fed. We have a range of bird food, feeders & bird tables to choose from. Make a compost bin – recycle autumn leaves, lawn clippings & leftover raw vegetable peelings by turning them into useful compost for your garden. It’ll provide vital nutrients for your soil. Compost bins and accessories are available. Start sowing seeds – grow your own beautiful bedding plants & tasty vegetables by sowing seeds into seed trays or troughs. A windowsill makes a perfect spot to start you seeds off. We have mini propagators, seed trays, peat pots & seed planting compost plus hundreds of seed varieties to choose from. Weeding – it’s never to early to start pulling up those pesky weeds. Help prepare your beds & lawns by pulling the weeds out whenever you see one. We have a selection of kid’s gloves & gardening tools in our bottom canopy. Build an insect hotel – lots of insects can be helpful in our gardens. Encouraging bees, ladybirds & other creepy crawlies into the garden will help to pollinate plants & keep pests at bay. Bee hives & insect stations can be found here.